Turn on your VBar Control by pressing down the Easy Dialog System Dial (EDS Dial), and at the same time rotate 90° clockwise. Turn off your VBar Control by pressing down the EDS Dial, and at the same time rotate 90° anti-clockwise. Choose OK from the Shutdown menu by rotating the EDS, then click OK. Mind that you cannot turn off your VBar Control as long as a VBar Control Receiver is connected, so always turn off your model first. On powering on, the main screen shows the current date and time in the upper left corner. The transmitter battery status is displayed in the lower left corner with an icon and the percentage. The current version number is displayed in the lower right corner. To the right, next to the EDS Dial, you see the still-closed setup menu, which is labelled select. The EDS Dial is both navigator (turn right or left) and selector (press down). Important Before you begin to set up a VBar equipped model, you must adjust at least basic settings such as Stick Mode and Mandatory Switches assignments. You must also remove the stepped brake plate from the collective stick gimbal and possibly change the collective stick to match your preferred stick mode. Rotate or press the EDS Dial to access the menu. If you do not continue, it will close again after a few seconds without input. Without a VBar Control Receiver connected, you can access only the transmitter setup functions. Bind a VBar Control Receiver to the VBar Control transmitter. Click for a list of available devices (10-digit serial number of connected VBar Flybarless controller or model name for already set-up models), select the device you want to bind. Application enable helps to enable or disable the Apps you wish to use. Check or uncheck the boxes as is applicable. Disabled Apps will not show in the setup process. All setup information required for flight operation is stored in each individual VBar, so you will not lose functionality or settings if you decide to disable or uninstall the App in order to empty menus or free memory. USB Mode allows to choose between USB Stick mode (for normal operation or setup/update purposes), Simulator (renders the VBar Control a USB game controller to go with your favorite simulator), or No USB (disables the USB connector temporarily). Display Contrast sets the black/white contrast of the display. Minimum Brightness sets the low threshold for the ambient light sensor. The display will not go darker than the value set here. To save on battery life, use the lowest convenient value. Sound volume can be set separately for the EDS Dial feedback as well as for system messages, telemetry and timer apps. Assign and Calibrate lets you select the stick mode (mind that you have to change the hardware if you switch between throttle-left and throttle-right modes. In case you want to have the collective stick reversed, choose modes 5-8 instead. You can calibrate the gimbals by selecting one control function at a time and thereby ‘show’ the VBar Control the limits and the center position by just moving the stick. It will learn and store the values automatically. Collective Center Fine allows to set the zero collective position, even though the gimbal has no spring to center itself. Move the stick to the precise mechanical center position according to the zero pitch line on the gimbal’s scale, press Set Zero!. Mandatory switches assigns three switches needed for basic flight operations and the directions according to your liking. Defaults are Motor—upper left, Bank switch (flight modes)—upper right, Buddy Box—lower right. The graphics show the actual assignments. In Local Switches you can set Par lock to lock the rotary knob(s) eventually assigned for changing parameters in flight, so you can not accidentally change parameters once this switch is flipped. It also contains a Security switch, which acts as a safety feature to double-lock the heli agains accidental spool-up. Select if you want to use this feature and assign a switch. The Switches panel as well as the main screen show a padlock icon which indicates whether the safety is disabled (open padlock as shown below) or enabled. Optional switches lets you assign Option 1-3 functions to switches according to your liking. Later you will assign Option 1-3 functions within additional apps. For this, you may require additional hardware and/or software. Transmitter name allows you to name your radio. To enter the name, select the position and then the character, using the EDS dial. Select Exit when done, select Reset to clear the name and start over. Archive These menu items contain file viewers for Screenshots, Battery Logs, Event Logs and if a GPS sensor is used on the model, the Latest GPS Position of the model, with a QR code which you can scan with your smart phone to e.g. find a lost model using the smart phone’s map App. allows for basic settings of different apps. Select USB mode Simulator from the Transmitter Setup. Connect the USB lead to your computer. There is no driver needed on Windows PCs nor on Macs. The operating system will detect VBar Control automatically as a game controller. In your preferred simulator software, select VControl as a controller and set up/calibrate as needed. Attention: Use the Simulator’s menus to adjust the Simulator to the VBar Control transmitter. Do not change settings (e.g. switches) in your VBar Control transmitter; this will affect behavior of your real-life models, too. Turn on VBar Control transmitter. Make sure motor/throttle controls are in OFF position. Select Bind from the Transmitter Setup menu. Turn on the VBar with the VBar Control Satellite Receiver connected. Wait a few seconds for the VBar Control to scan for available devices. Select the VBar Control Satellite Receiver from the list. VBar Control will confirm with the message ‘Connected’. Wait for 10 seconds for the receiver to go into bind mode. Only now turn on VBar Control transmitter. Attention If the re-binding procedure is no completed, a previously bound VBar Control Satellite Receiver remains bound to the last VBar Control transmitter it was bound to. The binding information is not automatically deleted by mistakenly powering up the model. Just turn the model off, turn on your VBar Control transmitter, then turn on the model again: it will re-connect at once. The built-in battery will be charged every time VBar Control is connected to a personal computer, using the USB cable. A green light will come on in the EDS Dial when the VBar Control is connected to a live USB port. To charge VBar Control without a PC, connect the wall charger provided to a wall outlet. Select the appropriate adapter for your country. 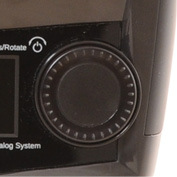 A red light will come on in the EDS Dial when the VBar Control is connected to the wall charger. Connect the charger to VBar Control. Charging time from the wall charger will be approx. 1.5 hours. The battery is full when the LED turns off. When left on the wall charger, trickle charge will keep the battery fully charged. Charging time from the USB cable will be approx. 10 hours (with the transmitter turned ON) or 40 hours (with the transmitter turned OFF). This is due to technical regulations of the USB power supply. You may connect both the USB cable and the wall charger at the same time. The integrated charging circuit in your VBar Control transmitter will always use the input with the highest power and disable the other input. In case the battery is exhaustively discharged, the charging time will noticeably increase to safely get the battery back to life. Set the low threshold of the ambient light sensor to a low value, so the transmitter always uses the least power needed for the display. Once a VBar Control Satellite Receiver is connected, you can check the antenna status at Model Status/Antenna Status. You will see bars indicating the overall link power as well as the signal strength of the four antennae (Tx=radio, Rx=receiver). If one of the four vertical bars falls below the indicated threshold, stop using VBar Control and find and remedy the cause. 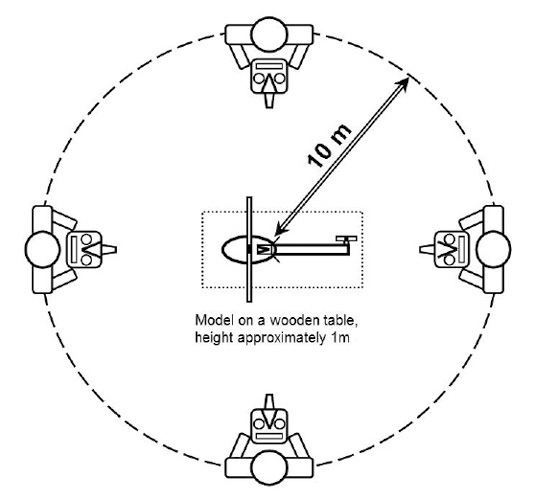 For a range check, walk around your model in a 30 ft/10 m radius. Point the antenna of VBar Control at the model as if you were flying it. Link power may not read below the vertical threshold line. If link power falls below the vertical threshold line, re-arrange the antennae and repeat the test. Do not place the model onto a metal surface for this test.